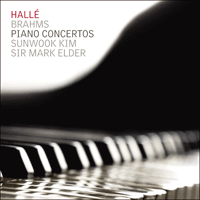 Brahms's two monumental piano concertos—so very different in tone and composed some two decades apart—remain at the heart of the repertoire. Sunwook Kim and The Hallé Orchestra have been performing them for many years, an interpretation now captured in this vivid new studio recording. Brahms’s two piano concertos are separated by two decades, and belong to two different phases of his life—well defined by contemporary images of him. When he was writing the first concerto in his early twenties, he appeared every inch the young Romantic hero, with a handsome profile, flowing fair hair and a dreamy look in his eye. But 1878, when he began the second concerto, was the year in which he grew a beard; full and soon to turn grey, this contributed to the persona of a gruff, restrained bachelor that he cultivated in middle age. The difference is apparent in the two works: the first serious and ardent, by turns stormy and intimate; the second more magisterial and relaxed, rhapsodic and sometimes playful. What they have in common is the effectiveness of their writing for the piano. Brahms was a pianist almost all his life. He made his first public appearance at the age of ten, and by the time he was 20 he was making a good living from the concert platform, performing among other things the last two Beethoven concertos. The solo parts of his concertos, both of which were written as vehicles for his own playing, are evidence of his technical ability. Even today, their demands are such that very few players take on the challenge of performing both concertos in a single evening (as in the concert in Sheffield City Hall which followed this recording). This is also a question of stamina, because both works are unusually long—the second in particular, because it is in four movements rather than the usual three. Brahms chose not to write the newer type of virtuoso concerto which became popular in the 19th century: short and often continuous, frequently beginning without an orchestral introduction, and with the emphasis on solo display and expressive melody rather than on discussion of the thematic material. Instead he aligned himself with the Classical tradition of Mozart and, especially, Beethoven, making each movement a substantial self-contained structure, beginning his first movements with a big orchestral ‘tutti’, and involving the orchestra with the soloist in the ‘symphonic’ development that came so naturally to him. The first piano concerto was Brahms’s first major orchestral work, and had a prolonged gestation. Its opening movement began life in 1854 as the first movement of a sonata for two pianos, and was re-cast the following year as the first movement of a large-scale symphony. Only in 1856 did Brahms decide to rework it for piano and orchestra, and to add two entirely new movements to make up a large-scale concerto. The work was completed by March 1858, with the help of a good deal of advice from the composer’s most trusted colleague, the violinist Joseph Joachim. But Brahms continued to make many revisions both before and after the first performance, which took place in Hanover in January 1859. The period in which the concerto was written was clouded by the mental breakdown of Brahms’s friend and mentor Robert Schumann, leading to his death in 1856. Its later stages were also coloured by Brahms’s growing feelings for Schumann’s widow Clara. Schumann’s friends used to call him ‘Mynheer Domine’ (meaning something like ‘lord and master’), and at one stage the slow movement of the Concerto was headed by words from the Mass (which can be fitted to the first theme), ‘Benedictus qui venit in nomine Domini’: ‘Blessed is he who comes in the name of the Lord’. Was Brahms identifying himself as Schumann’s heir? More probably he was thinking of Clara; and indeed he wrote to her in December 1856 that in the Adagio he was ‘painting a lovely portrait’ of her. The opening movement—in the Brahmsian time-signature of 6/4, two broad groups of three beats to the bar—begins with an orchestral tutti which establishes the scale and seriousness of the whole work. There is a powerful first theme which immediately pulls away from the home key while remaining grounded by a held D in the bass. This theme later recurs, in canon between the violins and the cellos and basses, in the midst of a series of contrasting lyrical ideas. 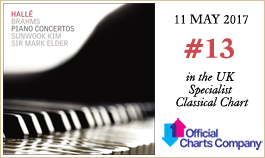 The piano makes its first entry with an addition to this series, and in the Classical manner proceeds to revisit the ideas of the introduction in collaboration with the orchestra, while also adding a heart-lifting new melody, the main ‘second subject’, in a sonorous solo passage. The development section starts with strenuous double octaves for the soloist, accompanied by fragments of the first theme, and goes on to alternate between such passages of bravura and drama and interludes of tender melody. The recapitulation opens with the first theme, again over a bass D but this time with the piano initially pulling away in a new harmonic direction. This is followed by the remaining ideas, in a different order but still with the second subject presented as a solo meditation; and the movement concludes with a coda at a faster tempo. The central slow movement is in D major and again in 6/4 time, though at a slower tempo. Muted upper strings and bassoons, over another pedal D, introduces the calm ‘Benedictus’ theme, with its flowing scales; the soloist responds with a decorative variation. There is a middle section in which hushed strings alternate with delicate piano tracery, in two episodes each rounded off by a lamenting woodwind melody. The reprise begins by turning a harmonic corner unexpectedly into the ‘Benedictus’ theme, and soon becomes more forceful than before; reminiscences of the middle section and a piano cadenza precede the quiet ending. The final Rondo has a vigorous main theme, and an overall plan apparently modelled on the corresponding movement of Beethoven’s third piano concerto—with three contrasting episodes, the central one beginning with a lyrical melody which is then developed in fugal texture. An extended major-key melody in Brahms’s first episode is brought back much more briefly in the third, con passione in the minor; but then (as in the Beethoven) a piano cadenza leads the way to a major-key coda. This brings the lyrical idea of the second episode to a new flowering, turns the rondo theme into a little march over a drone bass, and incorporates another cadenza before the assertive conclusion. Brahms began work on his second piano concerto in 1878, but put it on one side that year in order to finish his violin concerto, and completed it only in the summer of 1881. He took the solo part in a read-through with the celebrated Meiningen court orchestra, conducted by his friend Hans von Bülow, and in the first public performance in Budapest in November 1881, then on a tour of German cities with the Meiningen and other orchestras. Despite some initial disapproval among his friends of von Bülow’s ‘strolling players’, these appearances brought Brahms more widespread exposure as a composer and as a pianist than he had ever before enjoyed. The concerto begins arrestingly with a horn call answered immediately by the piano, and prompting an extended bravura solo—the closest this first movement comes to a cadenza. As in the obvious model for such an opening, Beethoven’s 'Emperor' concerto, this is not simply an introduction, but an integral part of the movement. It is followed by an orchestral tutti, led off by a new version of the horn call, and then an expanded traversal of the thematic material with the participation of the soloist—who converts an earlier idea into a solo passage in agile triplet rhythms which forms the principal second subject. A fiery intervention by the orchestra, with a minor-key version of the horn call, marks the beginning of the development section, which includes a good deal of chamber-music-like dialogue between soloist and orchestra. Eventually the horn call returns to signal the start of the recapitulation; and it recurs once more, emerging from dark mutterings in the bass register, at the start of the assertive coda. The ‘extra’ movement in the work’s four-movement plan is the Allegro appassionato. Brahms explained its inclusion by saying that the first movement was ‘too simple’ (or ‘innocuous’), and that the work ‘needed something strong and passionate before the equally simple Andante’. He also needed something in a different key from the B flat of all three of the other movements, and chose D minor—the stormy key of the first concerto. The movement is in sonata form, with a repeated opening section, but with a bright major-key episode towards the end of the development which corresponds to the contrasting trio section of a Classical scherzo. The Andante begins with a serene melody for solo cello, beginning in apparent 3/2 time (three groups of two beats to the bar) against the prevailing pulse of 6/4 (two groups of three). The latter time-signature and the scalewise counter-melody recall the ‘Benedictus’ theme in the Adagio of the first concerto, which suggests that this movement may be another portrait of Clara. The piano makes a delayed first entry, developing the cello’s melody with fantasia-like figuration. There is a brief slower episode in the remote key of F sharp major, with a theme on two clarinets supported by the piano with wide leaps into its crystalline upper register, before the solo cello re-enters to take its melody back into the home key for the hushed reprise. The finale is a rondo with a ‘graceful’ main theme which, like the corresponding idea in Beethoven’s fourth piano concerto, begins out of the home key and works its way into it. The first subsidiary episode begins with a suave melody for woodwind and strings in alternation which recalls the Hungarian gypsy music that Brahms had known and loved for many years; in true gypsy fashion, this brings a profusion of other ideas hard on its heels. The second episode plunges straight into development of the rondo theme. The third revisits the material of the first. After it, the rondo theme is transformed into triplet rhythms—a favourite device of Beethoven—to launch the slightly faster coda. For all the technical challenges of the solo part, this movement brings the concerto to a relaxed conclusion, on an expansive scale commensurate with the rest of the mighty work. Deux décennies séparent les deux concertos pour piano de Brahms et ils appartiennent à deux périodes différentes de sa vie—nettement différenciées par les portraits contemporains du compositeur. Quand il écrivait le concerto nº 1 et était âgé d’à peine plus de vingt ans, il avait tout du jeune héros romantique, avec un profil séduisant, une abondante chevelure blonde et dans les yeux un regard rêveur, mais en 1878, l’année où il entreprit de composer le concerto nº 2, il se laissa pousser une barbe fournie qui ne tarda pas à devenir poivre et sel, ce qui contribua à l’image de vieux garçon bourru et cauteleux qu’il cultiva en son âge mûr. La disparité est manifeste dans les deux ouvrages: le premier est sérieux et ardent, tour à tour orageux et intimiste, le second plus doctoral et détendu, rhapsodique et parfois malicieux. Ce que les deux concertos ont en commun est l’efficacité de leur écriture pianistique. Brahms fut pianiste pendant pratiquement toute sa vie. Il se produisit pour la première en public à 10 ans, et à 20 ans, il gagnait déjà bien sa vie en donnant des concerts, et notamment en interprétant les deux derniers concertos de Beethoven. Les parties solistes de ses propres concertos, toutes deux écrites pour mettre son jeu en valeur, illustrent amplement son haut niveau technique. Aujourd’hui encore, leurs difficultés sont telles que très peu de solistes relèvent le défi de jouer les deux ouvrages en une seule soirée. Il s’agit aussi d’une question d’endurance, car les deux concertos sont d’une longueur inhabituelle—le second en particulier, qui comporte quatre mouvements au lieu de correspondre au schéma tripartite traditionnel. Brahms fit le choix de ne pas écrire un concerto du type nouveau qui s’était popularisé au XIXe siècle: bref et souvent continu, fréquemment dépourvu d’introduction orchestrale, et mettant l’accent sur les prouesses solistes et une mélodie expressive plutôt que sur l’exploration du matériau thématique. Il préféra se conformer à la tradition classique de Mozart et surtout de Beethoven, faisant de chaque mouvement une structure autonome substantielle, ouvrant ses premiers mouvements par un grand tutti orchestral et amenant l’orchestre à participer avec le soliste au développement «symphonique» qui lui venait si naturellement. Le concerto pour piano nº 1 fut la première oeuvre orchestrale majeure de Brahms, et il connut une longue gestation. Son mouvement initial vit le jour en 1854: il s’agissait du premier mouvement d’une sonate pour deux pianos, qui fut remanié l’année suivante pour servir de premier mouvement à une symphonie de grande envergure. C’est seulement en 1856 que le compositeur décida de le réadapter pour piano et orchestre et de lui adjoindre deux mouvements entièrement nouveaux afin de constituer un grand concerto à part entière. L’ouvrage fut achevé en mars 1858, avec l’aide et les nombreux conseils du confrère en qui Brahms avait la plus grande confiance, le violoniste Joseph Joachim. Toutefois, le compositeur continua de procéder à d’abondantes modifications, tant avant qu’après la création du morceau, qui eut lieu à Hanovre en janvier 1859. La période de composition du concerto fut assombrie par la dépression nerveuse de l’ami et mentor de Brahms Robert Schumann, qui finit par provoquer sa mort en 1856. Les dernières phases d’écriture furent également marquées par les sentiments de plus en plus tendres que Brahms éprouvait pour Clara, la veuve de Schumann. Les amis de celui-ci avaient l’habitude de l’appeler «Mynheer Domine» (à peu près l’équivalent de «mon seigneur et maître»), et le mouvement lent fut un temps préfacé par les paroles de la liturgie latine (que l’on peut associer aux notes du premier thème), «Benedictus qui venit in nomine Domini»: «Béni soit celui qui vient au nom du Seigneur». Brahms se considérait-il comme l’héritier de Schumann? Il est plus probable qu’il songeait à Clara; et de fait, il lui écrivit en décembre 1856 que dans son Adagio, il peignait «un ravissant portrait» d’elle. Le mouvement initial—dans un 6/4 très brahmsien, soit deux larges groupes de trois temps par mesure—commence par un tutti orchestral qui assoit l’ampleur et la gravité de l’ouvrage dans son ensemble. Un premier thème puissant s’extrait immédiatement de la tonalité de départ tout en demeurant ancré par une pédale de ré à la basse. Ce thème reparaît par la suite, en canon entre les violons et les violoncelles et les contrebasses, au coeur d’une série d’idées lyriques contrastées. Le piano effectue sa première entrée avec une contribution à la série et, à la manière classique, se met à revisiter les idées de l’introduction en collaboration avec l’orchestre, tout en ajoutant une nouvelle mélodie entraînante, le «second sujet» principal, dans un passage soliste retentissant. La section de développement débute par des doubles octaves difficiles pour le soliste, accompagnées de fragments du premier thème, et se poursuit en alternant des passages virtuoses et dramatiques du même type et des interludes tendrement mélodiques. La récapitulation s’ouvre sur le premier thème, à nouveau sur une pédale basse de ré, mais cette fois avec le piano qui commence par s’éloigner dans une nouvelle direction harmonique. Viennent ensuite les autres idées, dans un ordre différent mais toujours avec le second sujet présenté comme une méditation soliste, et le mouvement s’achève par une coda prise sur un tempo plus rapide. Le mouvement lent central, en ré majeur, est lui aussi à 6/4, mais avec un tempo plus lent. Les cordes aiguës et les bassons avec sourdine, au-dessus d’une nouvelle pédale de ré, introduisent le paisible thème de «Benedictus», avec ses flots de gammes; le soliste répond par une variation ornementale. Dans une section centrale, les cordes assourdies alternent avec de délicats entrelacs de piano, dans deux épisodes dont chacun est couronné d’une mélopée de bois. La reprise commence en prenant un virage harmonique inattendu avec le thème de «Benedictus», et ne tarde pas à se faire plus emphatique qu’auparavant; des réminiscences de la section centrale et une cadence du piano précèdent la calme conclusion. Le Rondo final est pourvu d’un vigoureux thème principal et d’un schéma d’ensemble apparemment modelé sur le mouvement correspondant du troisième concerto pour piano de Beethoven—avec trois épisodes contrastés, celui du milieu commençant par un mélodie lyrique qui est ensuite développée dans une texture contrapuntique. Une longue mélodie en majeur qui figure dans le premier épisode revient d’une manière beaucoup plus fugace dans le troisième, en mineur et avec l’indication con passione, mais c’est alors (comme dans l’ouvrage de Beethoven) qu’une cadence de piano ouvre la voie vers une coda en majeur. Celle-ci amène une nouvelle floraison de l’idée lyrique du deuxième épisode, transforme le thème de rondo en une petite marche au-dessus d’un bourdon de basse et intègre encore une cadence avant la conclusion affirmée. Brahms commença à travailler à son second concerto pour piano en 1878, mais il le mit de côté cette même année afin d’achever son concerto pour violon et ne le mena à bien que durant l’été 1881. Il en interpréta la partie soliste lors d’une première lecture avec le fameux orchestre de la cour de Meiningen, sous la direction de son ami Hans von Bülow, ainsi que lors de la création publique à Budapest en novembre 1881, puis il le reprit dans le cadre d’une tournée des villes d’Allemagne avec l’orchestre de Meiningen et d’autres formations. Bien que certains de ses amis aient d’abord manifesté leur désapprobation vis à vis des «musiciens ambulants» de von Bülow, ces concerts apportèrent à Brahms une notoriété bien plus importante que celle dont il avait joui jusqu’alors, que ce soit comme compositeur ou comme pianiste. Le concerto commence de manière frappante par un appel de cor auquel le piano répond aussitôt et qui déclenche un long solo virtuose—le passage de ce premier mouvement le plus apparenté à une cadence. Comme dans le modèle le plus évident d’une telle ouverture—le concerto nº 5 «Empereur» de Beethoven—il ne s’agit pas simplement d’une introduction, mais d’une partie intégrante du mouvement. Elle est suivie d’un tutti orchestral emmené par une nouvelle version de l’appel de cor, puis une longue exploration du matériau thématique avec la participation du soliste—qui transforme une idée antérieure en un vif passage de triolets qui constituent le second sujet principal. Une fougueuse intervention de l’orchestre, avec une version en mineur de l’appel de cor, marque le début de la section de développement, qui comporte une grande part de dialogue de type chambriste entre le soliste et l’orchestre. L’appel de cor finit par revenir pour signaler le début de la récapitulation et reparaît encore une fois, émergeant de sombres marmonnements dans le registre grave, au début de la coda pleine d’assurance. Le mouvement «supplémentaire» de la structure quadripartite de l’ouvrage est l’Allegro appassionato. Brahms expliquait son inclusion en déclarant que le premier mouvement était «trop simple» (ou «anodin») et que le concerto «avait besoin de quelque chose de fort et de passionné avant l’Andante, lui aussi tout simple». Il lui fallait aussi un passage dans une tonalité différente du si bémol majeur des trois autres mouvements, et le compositeur arrêta son choix sur le ré mineur—l’orageuse tonalité du premier concerto. Le mouvement est en forme-sonate, avec une section d’ouverture répétée, mais un brillant épisode en majeur vers la fin du développement correspond à la section de trio qui fait contraste dans les scherzos classiques. L’Andante débute par une mélodie sereine pour violoncelle seul, sur une mesure apparente de 3/2 (trois groupes de deux temps par mesure) opposée à la pulsation dominante de 6/4 (deux groupes de trois). Ce 6/4 et la contre-mélodie par gammes rappellent le thème de «Benedictus» de l’Adagio du premier concerto, ce qui donne à penser que ce mouvement pourrait être un autre portrait de Clara. Le piano effectue une première entrée différée, développant la mélodie du violoncelle avec des traits qui évoquent une fantasia. Vient ensuite un bref épisode plus lent dans la tonalité lointaine de fa dièse majeur, avec un thème confié à deux clarinettes soutenues par le piano, qui exécute de larges sauts vers les notes cristallines de son registre aigu avant que le violoncelle soliste ne refasse son entrée, ramenant la mélodie dans la tonalité de départ pour la reprise feutrée. Le finale est un rondo doté d’un thème principal «gracieux» qui, à l’instar de l’idée correspondante du concerto pour piano nº 4 de Beethoven, démarre dans une tonalité qui n’est pas celle du début de l’ouvrage mais la rejoint progressivement. Le premier épisode subsidiaire commence par une mélodie toute de suavité pour les vents et les cordes en alternance rappelant la musique tzigane hongroise que Brahms connaissait et aimait depuis de nombreuses années; fidèle à la manière tzigane, elle donne lieu à une profusion d’autres idées qui lui succèdent rapidement. Le deuxième épisode se lance directement dans le développement du thème du rondo. Le troisième revisite le matériau du premier, après quoi, le thème du rondo est transformé en rythmes de triolets—procédé qu’affectionnait Beethoven—pour attaquer la coda, légèrement plus vive. En dépit de tous les défis techniques qu’il pose au soliste, ce mouvement mène le concerto à une conclusion détendue, d’une ampleur bien adaptée au reste de cet ouvrage monumental. Es liegen zwei Jahrzehnte zwischen den beiden Klavierkonzerten von Johannes Brahms, und sie fallen in unterschiedliche Lebensphasen des Komponisten, wie auch zeitgenössische Porträts bezeugen. Während der Entstehungszeit des Ersten Klavierkonzerts war Brahms Anfang zwanzig, ganz der romantische Held mit ansehnlichem Profil, wallenden hellen Haaren und träumerischem Blick. Im Jahr 1878, als er mit der Arbeit an seinem Zweiten Klavierkonzert begann, ließ er sich einen Bart wachsen; der volle, bald graue Bart unterstrich seinen Auftritt als eigenwilliger Junggeselle, den er im mittleren Alter kultivierte. Dieser Unterschied kommt auch in den beiden Werken zum Ausdruck: Das erste ist ernst und leidenschaftlich, auch stürmisch und intim, das zweite eher weltmännisch und entspannt, rhapsodisch und mitunter spielerisch. Beide sind jedoch höchst effektive Stücke für das Klavier. Brahms war Zeit seines Lebens Pianist. Er trat zum ersten Mal im Alter von zehn Jahren auf. Als er zwanzig war, verdiente er bereits gutes Geld als Konzertpianist und führte unter anderem die letzten beiden Konzerte Beethovens auf. Die Solopassagen seiner Konzerte dienten ihm als Vehikel für sein eigenes Spiel und bezeugen seine technische Virtuosität. Auch heute noch gelten sie als so schwierig, dass sich nur wenige der Herausforderung gewachsen sehen, beide Konzerte an einem einzigen Abend darzubieten. Nicht zuletzt ist es auch eine Frage der Kondition, da beide Werke ungewöhnlich lang sind—dies gilt besonders für das Klavierkonzert Nr. 2, das aus vier Sätzen anstatt der üblichen drei besteht. Brahms entschied sich gegen ein virtuoses Konzert im modernen Stil, der im 19. Jahrhundert in Mode gekommen war. Diese Konzerte waren typischerweise kurz, häufig fortlaufend, mit orchestraler Einleitung und Betonung auf der Solodarbietung und einer expressiven Melodie anstelle einer Diskussion des thematischen Materials. Brahms verschrieb sich vielmehr der klassischen Tradition nach Mozart und insbesondere Beethoven: Jeder Satz verfügt über eine solide, in sich geschlossene Struktur, der erste Satz beginnt mit einem großen orchestralen Tutti, und in der ihm so natürlichen „sinfonischen“ Durchführung spielen Orchester und Solist miteinander. Das Erste Klavierkonzert war Brahms’ erstes großes Orchesterwerk und langwierig in der Entstehung. Der Vorläufer des ersten Satzes stammt aus dem Jahr 1854—damals noch als erster Satz für eine Sonate für zwei Klaviere gedacht, bevor daraus im darauffolgenden Jahr der erste Satz für eine Sinfonie großen Stils werden sollte. Erst 1856 bearbeitete Brahms den Satz neu für Klavier und Orchester, wobei er zwei gänzlich neue Sätze hinzufügte, um ein groß dimensioniertes Konzert zu schaffen. Dieses Werk wurde im März 1858 vollendet; sein vertrauter Kollege, der Violinist Joseph Joachim, stand ihm dabei mit Rat zur Seite. Brahms nahm jedoch noch zahlreiche Revisionen vor, sowohl vor und nach der Uraufführung in Hannover im Januar 1859. Die Entstehungszeit des Werkes war zunächst überschattet vom mentalen Zusammenbruch von Brahms’ Freund und Mentor Robert Schumann, bis zu dessen Tod im Jahr 1856. In den letzten Phasen der Entstehung kamen außerdem Brahms’ wachsende Gefühle für Schumanns Witwe Clara zum Tragen. Schumanns Freunde, so auch Brahms, pflegten diesen mit der Bezeichnung „Mynheer Domine“ anzureden, und vor dem langsamen Satz stand zeitweilig ein lateinisches Motto, das zum ersten Thema passt—die lateinischen Worte aus der Heiligen Messe „Benedictus qui venit in nomine Domini“ („Hochgelobt sei der, der da kommt im Namen des Herrn“). Sah Brahms sich als Schumanns Erben? Wahrscheinlicher ist wohl, dass seine Gedanken Clara nachhingen; tatsächlich schrieb er ihr im Dezember 1856, dass er an einem „sanften Portrait“ von ihr male—dem Adagio. Der Eröffnungssatz—im Brahms’schen 6/4-Takt, zwei breite Gruppen mit drei Schlägen pro Takt—beginnt mit einem orchestralen Tutti, mit dem die Dimension und die Ernsthaftigkeit des gesamten Werkes bereits offenbar werden. Ein mächtiges erstes Thema drängt sogleich fort von der Haupttonart und bleibt verankert durch einen Orgelpunkt D in den Bässen. Dieses Thema kehrt später wieder, innerhalb des Kanons zwischen Violinen, Violoncelli und Bässen, inmitten einer Reihe kontrastierender lyrischer Motive. Das Klavier schließt sich mit seinem ersten Auftritt dieser Reihe an; in klassischer Manier greift es die Eingangsmotive in Zusammenwirken mit dem Orchester auf und fügt in einer klangvollen Solopassage eine erhebende neue Melodie als zentrales „zweites Thema“ hinzu. Die Durchführung beginnt mit anstrengenden Doppeloktaven für den Solisten, begleitet von Fragmenten des ersten Themas, und wechselt im weiteren Verlauf zwischen bravourösen und dramatischen Passagen und zarten Melodien als Zwischenspiel. Die Reprise nimmt zunächst das erste Thema wieder auf, wie zuvor über einem D in den Bässen, nun aber strebt das Klavier in eine neue harmonische Richtung. Es schließen sich die übrigen Motive an—dieses Mal in unterschiedlicher Reihenfolge, das zweite Thema wird jedoch auch hier wieder als Meditation des Solisten vorgestellt; der Satz endet mit einer Coda in einem schnellerem Tempo. Der zentrale langsame Satz, in D-Dur und 6/4-Takt, schlägt ein beschaulicheres Tempo ein. Gedämpfte hohe Streicher und Fagotte, erneut über einem Orgelpunkt D, leiten das ruhige „Benedictus“-Thema mit seinen fließenden Tonleitern ein; der Solist antwortet mit einer schmückenden Variation. Im Mittelteil wechseln sich gedämpfte Streicher mit filigranem Klavierspiel ab; die zwei Episoden werden jeweils durch eine klagende Melodie der Holzbläser abgerundet. Die Reprise beginnt mit einer unerwarteten harmonischen Wende zum „Benedictus“-Thema und zeigt sich bald energischer als zuvor; auf Reminiszenzen an den Mittelteil sowie eine Kadenz des Klaviers folgt ein ruhiger Schluss. Für das Finale entschied sich Brahms für ein Rondo mit einem dynamischen Hauptthema, das offenbar dem korrespondierenden Satz in Beethovens Klavierkonzert Nr. 3 nachgebildet ist—mit drei kontrastierenden Episoden, wobei die zentrale Episode mit einer lyrischen Melodie beginnt, die dann zu einem Fugato entwickelt wird. Eine ausgedehnte Melodie in Dur aus Brahms’ erster Episode wird stark verkürzt in der dritten aufgegriffen, con passione in Moll; anschließend jedoch führt eine Kadenz des Klaviers (wie bei Beethoven) eine Coda in Dur ein. Hierin kommt das lyrische Motiv der zweiten Episode zu neuer Blüte, das Rondo-Thema tritt nun als kleiner Marsch über einem Orgelpunkt in den Bässen in Erscheinung, auch folgt eine weitere Kadenz, bevor der Satz in einen beherzten Schluss mündet. Brahms begann mit der Arbeit an seinem Zweiten Klavierkonzert im Jahr 1878, legte es aber im gleichen Jahr wieder beiseite, um sein Violinkonzert zu vollenden. Das Klavierkonzert kam erst im Sommer 1881 zum Abschluss. Er erprobte den Solopart mit dem gefeierten Hoforchester von Meiningen, unter der Dirigentschaft seines Freundes Hans von Bülow. Die öffentliche Uraufführung erfolgte in Budapest im November 1881; daran schloss sich eine Konzertreise durch deutsche Städte an, mit dem Meininger Orchester sowie anderen Orchestern. Trotz einiger anfänglicher Einwände seitens seiner Freunde bezüglich von Bülows „umherziehenden Musikern“ verschafften diese Auftritte Brahms eine breitere Öffentlichkeit als Komponist und Pianist denn je zuvor. Das Konzert beginnt eindrucksvoll mit einem Hornruf, auf den sogleich das Klavier antwortet—der Auftakt zu einer längeren, virtuosen Solokadenz. Wie bei der augenscheinlichen Vorlage für diesen Beginn—Beethovens Fünftem Klavierkonzert—handelt es sich auch hier nicht einfach nur um eine Eröffnung, sondern um einen wesentlichen Teil des Satzes. Auf eine neue Version des Hornrufs folgt ein orchestrales Tutti, danach eine ausgedehnte Beschreitung des thematischen Materials, an der auch der Solist teilhat—hierbei wird ein früheres Motiv zu einer Solopassage geformt, mit agilen Triolenrhythmen, die das zentrale zweite Thema bilden. Eine feurige Einmischung des Orchesters in Form einer Mollversion des Hornrufs markiert den Beginn der Durchführung, während der sich eine Reihe von kammermusikhaften Dialogen zwischen Solist und Orchester entfalten. Die Wiederkehr des Hornrufs schließlich signalisiert den Beginn der Reprise; und es kehrt mehr als einmal wieder, taucht auf aus dem dunklen Geraune im Bassregister zu Beginn der nachdrücklichen Coda. Der „zusätzliche“ Satz im Vier-Sätze-Plan des Werkes ist das Allegro appassionato. Brahms begründete diese Entscheidung damit, dass der erste Satz „zu einfach“—oder „harmlos“—sei und das Werk vor dem ebenfalls schlichten Andante mehr Stärke und Leidenschaft brauche. Er benötigte dafür eine andere Tonart als das B-Dur der übrigen drei Sätze und wählte d-Moll—die stürmische Tonart des Ersten Klavierkonzerts. Der Satz hat die Form einer Sonate, mit einer wiederholten Eröffnungssequenz, aber mit einer hellen Episode in Dur gegen Ende der Durchführung, die dem kontrastierenden Trioabschnitt eines klassischen Scherzos entspricht. Das Andante beginnt mit einer gefühlvollen Melodie des Violoncellos, im 3/2-Takt (drei Gruppen zu zwei Schlägen pro Takt) entgegen dem vorherrschenden 6/4 (zwei Gruppen zu drei). Letztere Taktart sowie die tonleiterartige Gegenmelodie erinnern an das „Benedictus“-Thema des Adagio im Ersten Klavierkonzert—dies legt nahe, dass es sich auch hier um ein Porträt Claras handeln könnte. Das Klavier kommt verzögert zu seinem ersten Einsatz und entwickelt die Melodie des Violoncellos mit fantasieartigen Verzierungen. Es folgt eine kurze, langsamere Episode in der entfernten Tonart Fis-Dur—ein Thema zweier Klarinetten mit Unterstützung des Klaviers, das sich zu weiten Sprüngen in sein kristallines höheres Register aufschwingt. Anschließend kehrt das Violoncello wieder und führt seine Melodie zur gedämpften Reprise in die Haupttonart zurück. Das Finale ist ein Rondo mit einem „anmutigen“ Hauptthema, das—wie das auf der gleichen Idee aufbauende Vierte Klavierkonzert Beethovens—außerhalb der Haupttonart beginnt und sich in diese hineinwindet. Den Anfang der ersten untergeordneten Episode bildet eine charmante Melodie für abwechselnde Holzbläser und Streicher; sie ruft die ungarische Zigeunermusik auf, die Brahms schon seit vielen Jahren kannte und schätzte. Im gleichen Geiste ergießt sich daraufhin ein Füllhorn an weiteren Motiven. Die zweite Episode stürzt sich sogleich in die Entwicklung des Rondo-Themas; die dritte nimmt das Material der ersten auf. Nun wird das Rondo-Thema in Triolenrhythmen umgewandelt—wie es auch Beethoven gerne tat—, und die etwas schnellere Coda beginnt. Bei allen technischen Herausforderungen des Soloparts bringt dieser Satz das Klavierkonzert grandios angelegt, dem Rest dieses imposanten Werkes entsprechend, zu einem entspannten Ende.